On Tuesday, there was news of a lady getting ejected from a Missouri waterpark for wearing a skimpy bikini. Meanwhile in Vienna, Rihanna posted the first picture below of her teeny weeny yellow - red guitar bikini with the caption "Oh baby I'm a Roc StaR." Feeling terribly sorry for the American lady, I commented, "I swear .... Americans. Just come to the Caribbean and RELAX!" At least in the Caribbean, a woman's size or whether she's flaunting too much skin won't be judged harshly. To convey this message, especially since I have been missing from this blog since Spring, I've decided to introduce a few Caribbean swimwear designers. I would happily mention others, yet a complaint I have of Caribbean fashion is that designers never seem to make their designs, collections or products accessible. Please consider a website for online shopping. I would much rather the ability to buy a piece from your 'collection' instead of just viewing your collection online. If you can't give the world an online shop, 'think big ... be modern'. Consider a Facebook Fanage with pertinent info: name, address (include country), telephone number (include area code), email address. Tell us something about your designs. Tease us with beautiful and creative pictures or video of your collection or pieces. Use Instagram and Twitter. With all the above being mentioned, it was easy to select the following 10 Caribbean designers / businesses due to their current 2013 collections. Also I get a sense of their Caribbean pride! 1. Bang Swimwear - If you fell in love with Rih Rih's bikini seen below, then this is your stop! Bang Swimwear is the brainchild of Lingerie & Swimwear Model Nell Robinson and London Fashion Buyer Ann Marie Clarke. Raised in the hills of Kingston, Jamaica but now living in London both Nell and Ann Marie are no strangers to the beautiful beaches of the Caribbean and the attire that goes along with a beach lifestyle. 2. Chandra Maharaj Swimwear - "Rio (Brazil) brought her to life, Trinidad showed her how to live it." Chandra Maharaj is no stranger to this blog. One lucky Sweet 7 fan won a Chandra Maharaj bikini of choice too. "So sorry, you missed out! :-P " Not only has Chandra Maharaj expanded to include an all new fitness line, she too has celebrities flashing her swimwear on the beaches of The Bahamas, Angela Simmons. 3. LIILAH - Visit any popular Trinibagonian site and Trini socialites are wearing Lisa Marie Henry designs, a Fashion designer for her label Liilah. Lisa shares "I'm from Trinidad, and spend a lot of time at my workshop in Woodbrook or at the beach." 4. Rhion Romany - another Trinidad & Tobago designer who describes their designs as "the embodiment of boldness, sophistication and timelessness." ... And oh baby, that new resort collection "MONROE" is divine! Check out this teaser video. 5. Viksara Swimwear - I dare you to click on the link to the left. LOL! Yes, only if you have the heart to see the entire Viksara Swimwear 2013 collection. "Viksara was created to appeal to the woman who seeks exclusive designs that combine contemporary innovation & a ready-to-wear appeal at great prices!" 6. HuTcH Beachwear by Dominic Hutchinson - How are you doing so far? We're only at #6! Tobago Fashion Weekend 2013 introduced me to this male designer. And I was so excited to see one of my favorite models on Caribbean Next Top Model, Season 1, Miss World Trinidad & Tobago 2012 and also the bangin' vixen in the Trinidad James "Females Welcomed" video, Athaliah Samuel (middle - pink bikini). "Tobago Fashion Weekend 2013 backstage prep. Styling done by BCO Style's head Stylist Risanne Martin." 7. Christian Boucaud Designs - I've mentioned this Trinidad & Tobago designer here before. ... And this swimwear 2013, right here, *FAINTS* so I am very much a fan! 8. Jae Jolly Designs "is best known for intricate detailing and also the mixing and contrasting of different fabrics and textures. The label provides unique, trendy and high quality ready to wear clothing and swimwear designs." ... And this Jamaican designer Janel Jolly is ready to ship to USA, UK, Canada and anywhere in the Caribbean. 9. Coco K'nel Bikini - If you're looking for Brazilian hand made itsy-bitsy, teeny-weeny, probably-a-thong bikini with a Caribbean touch, visit this French designed and owned online shop from Martinique. My Martiniquan friends tease me, "the island we can see you from, Nyree!" Martinique is north of my island, St.Lucia. By the way, every other designer can be most inspired with the way in which this young lady markets her business. 10. Pink Lemonade - So the BIG TEN. 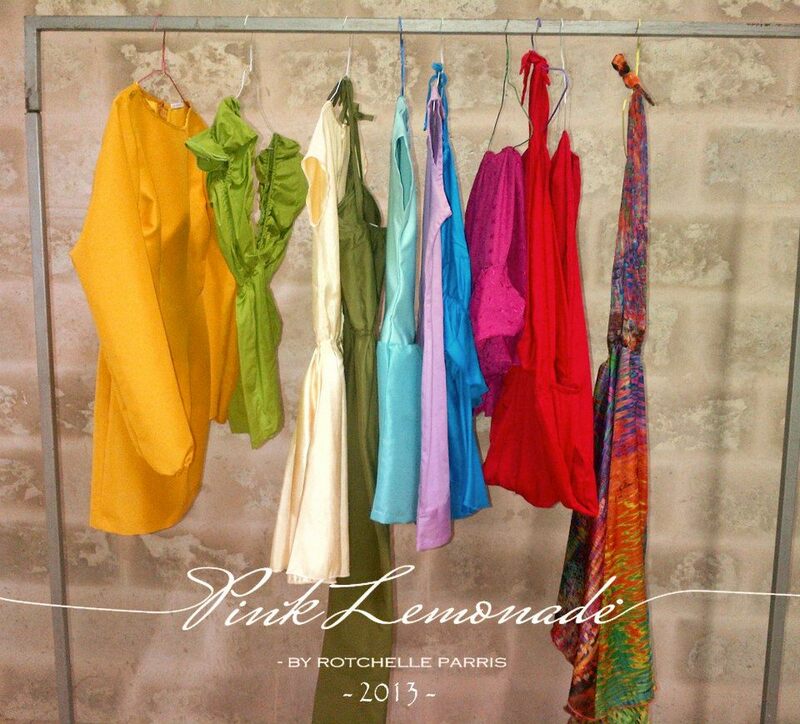 After sharing a few Caribbean swimwear designers, mostly from Trinidad & Tobago, I felt it necessary to include this fun, flirty clothing line, designed by Rotchelle Parris from Barbados. I just love the name of her clothing label. Definitely fashion pieces "to go limin' & fetin'." (Translation: "to go hangout and party").